Pennant shaped map push pins are 1" long and 5/8" wide, tapering down to a point. The shaft is 1 1/8" long. These pennant map push pins can be written on with a fine tip permanent marker. 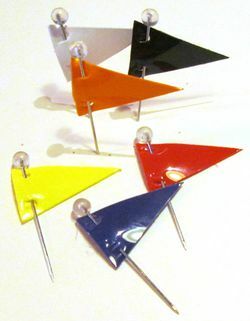 There are six color choices for the pennant map push pins and they are packaged in boxes of 25.